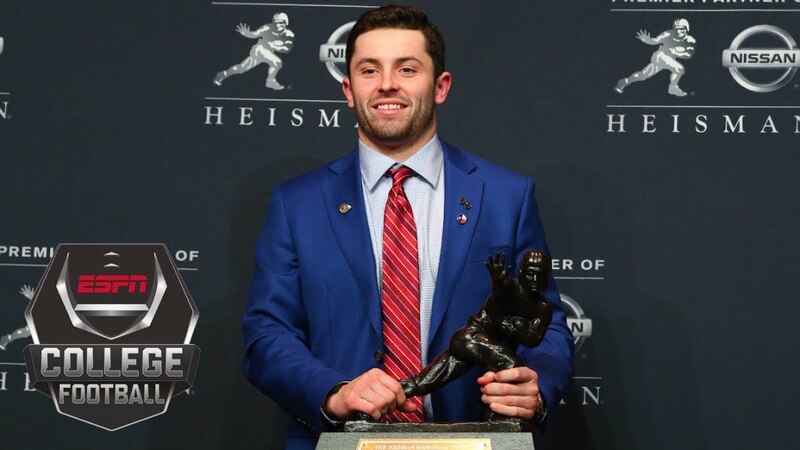 Baker Mayfield - Biography, Girlfriend, Career Stats, How Tall is He? Home Sports Baker Mayfield – Biography, Girlfriend, Career Stats, How Tall is He? Another chap to watch out for in the American National Football League (NFL) is Baker Mayfield. Drafted by the Cleveland Browns as a quarterback in the 2018 NFL Draft, Mayfield is already carving out a niche for himself in NFL with impressive moves after his debut. He signed a 4-year contract worth $32.68 million with the Browns. The young talent was a sensational player in his college years with the Oklahoma Sooners football team, where he dished out a whopping 1,026 completion passes for 14,607 passing yards and 131 touchdowns all in 48 games played of which he started 44 of them; thereby endearing himself to the fans while winning the coveted Heisman Trophy among other notable awards. Baker Reagan Mayfield was born on the 14th of April 1995 in Austin, Texas. His parents are James and Gina Mayfield and he grew up in Texas with his family. Mayfield has an older sibling, Matt Mayfield who is a baseball player for Texas A&M. He identifies as a North American by ethnicity. He schooled in Lake Travis High School, where he participated actively in the school’s football team, the Cavaliers. He played as a quarterback and recorded outstanding performances, leading the team to a 4A State Championship win in 2011 on a run of 25 wins out of 27 games played. Baker Mayfield promising performance in high school made him an enticing prospect as he first enrolled into Texas Tech University, in Lubbock, Texas in 2013 playing for the Red Raiders for just one season before seeking transfer to join Oklahoma in 2014. In Oklahoma, Baker Mayfield spent a whole season without getting any playing time on the field because of the National Collegiate Athletic Association (NCCA) transfer rules which prevented players on scholarship who transfer from one school to another to join up with their new team for the same season they transferred. Baker viciously contested this rule, and although he lost his appeal, the rule was amended and is now called the Baker Mayfield Rule. He bounced back to action in the 2015 season, finishing up that year with 3,700 passing yards, 36 touchdowns, and 7 interceptions, as a starting quarterback, beating Trevor Knight to it. Baker led his team to their 3rd straight Big 12 championship and also earned them the Sugar Bowl with his score of 296 passing yards, two touchdowns, and also picking up the MVP award. Others awards included; Heisman trophy which he won in 2017, the Maxwell Awards, Walter Camp Awards, just to mention a few. Throughout his collegiate career (with the Texas Tech and the Oklahoma Sooners), he played 48 games and 44 of which he started recording 1,026 completion passes for 14,607 passing yards, and 131 touchdowns. Mayfield was drafted by the Cleveland Browns as a first overall pick in the 2018 NFL Draft and he became the face of the franchise. He has put up a good show in his rookie season, helping the Browns end a 19-game losing streak against the New York Jets. He has earned the 100.1 quarterback rating with his 73.9% completion mark. We hope to see him do much more as the season goes on. The young talent once boasted that he was born with a silver spoon, unlike some other athletes who hustled their ways to the top. The statement generated a lot of debates online. He is estimated to worth $30 million with his career earnings calculated to be $22.33 million in one season and a cap hit of $5.94 million. Baker Mayfield is not only a talented player but comes along blessed with good looks as well. However, he is already smitten with his beautiful new girlfriend, Emily Wilkinson whom, he left his college girlfriend, Morgan Mayberry, to be with. The couple is already engaged and we expect to hear the wedding bells soon. Emily who is a model and also a social media influencer is currently residing in Los Angeles and a staff in Beverly Hills Plastic center. The Cleveland Browns quarterback is blessed with an amazing physique and he stands tall with a height measured at 6 feet 1 inch, a frame which is supported a weight of about 98 kg. No doubt, Baker Mayfield is a chap to watch out for in the next decade.